The new Comcast tower, on the left, is taller than the Comcast Center on the right. Liberty Property Trust says construction is over budget. 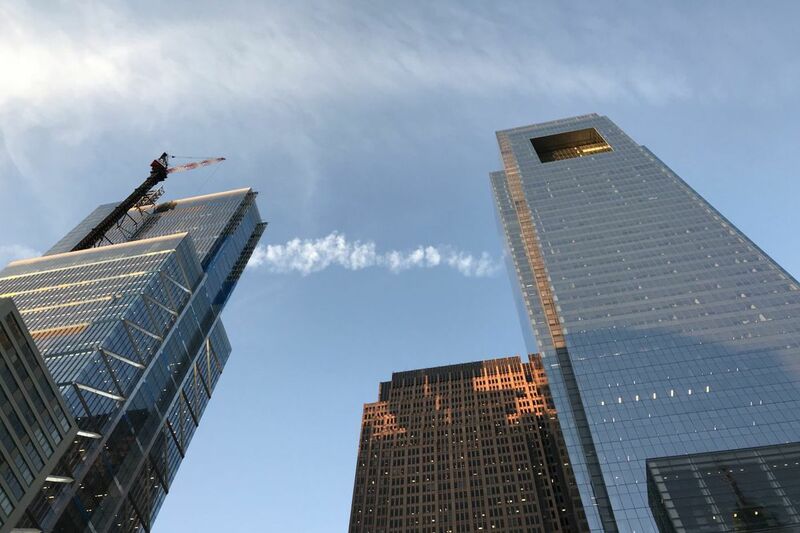 The new 60-story Comcast Corp. tower in Center City is running $67 million over budget, Liberty Property Trust said on Wednesday. With a total projected cost of $1.5 billion, that overrun would amount to 4.5 percent of the current budget. The building was originally scheduled to open in late 2017. Its offices are now expected to open this summer, with the hotel's debut coming in the late fall. The tower carried an initial price tag of $1.2 billion in January 2014. The overall cost of the Comcast project has slowly climbed over the years as various changes have been made, such as adding an additional floor. Liberty Property — which is a 20 percent owner of the tower and is managing its construction — characterized the recent overruns as a contract dispute with its general contractor, LF Driscoll, and said it would not prevent the building from opening later this year. Liberty Property spokeswoman Jeanne Leonard said in an email Wednesday that "this is ultimately a contractual issue between Liberty and our general contractor. Our top priority is completing this magnificent project and work is proceeding without interruption. This issue will not affect the project's delivery. Comcast Technology Center will open as scheduled this summer, with the hotel to open in late fall." LF Driscoll did not respond for comment. Comcast referred questions to Liberty Property. The Comcast Technology Center will be the tallest building in Philadelphia, with panoramic views of the region. The top floors of the building will contain a Four Seasons Hotel. In addition, Comcast CEO Brian Roberts bought three condo units in the tower for $14.3 million. The residences will take up the entire 45th floor and will be run by the Four Seasons. "If the company were to incur additional expenses in connection with its development cost guarantee, such amounts could be material to its results of operations in future periods," Liberty Property said in the Wednesday filing with the Securities and Exchange Commission. Liberty Property stock closed down slightly on Wednesday at $40.09, down $0.32. The company is based in Malvern.